The National Day reception commemorating the 70th anniversary of India becoming a republic took place in Beijing on January 28, during which hundreds of guests including government officials, diplomats, entrepreneurs, media and friendly groups attended the event. 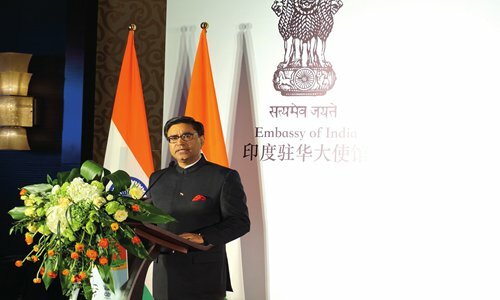 Indian Ambassador to China Vikram Misri delivered a welcome speech, in which he reviewed the fruitful bilateral relations capped by the high-level visits, trade and investments and people-to-people connections on both sides and he also set good expectations for the future. "The year 2018 has indeed witnessed an all-around expansion in our ties, covering political and economic cooperation, people-to-people exchanges and defense interactions," the ambassador said. "Our trade and economic ties with China witnessed steady growth, with three commercial protocols being signed in the last eight months. In the coming year, we look forward to sustaining the momentum of our robust bilateral ties with China, and to further deepen the cultural connection between our two ancient civilizations." Misri noted that ten focus areas for furthering contacts were identified in December of last year: tourism, sports, yoga, traditional medicine, film and television, museums, education, culture, youth and provincial-level exchanges. "This provides both our countries with a busy roadmap for the rest of the year," he said. China's assistant foreign minister Zhang Hanhui also attended the event.